There is no part of the province where you are risk free. This latest risk map … shows areas of greatest risk, moderate risk and lower risk. Because the ticks are transported by birds such as robins, wrens, finches and other birds there is the risk of infected ticks being dropped off in your backyard, local park, school yard, hiking trails, etc. is always present. Remember, No Tick is a Good Tick, so any tick attachment must be taken seriously because there are many different pathogens ticks can transmit. How you remove a tick is critical so as to not squeeze the body of the tick which can inoculate you with whatever is in the gut of the tick. Do Not smother the tick with oils, lotion, soap, etc. and Do Not use heat to remove a tick. These methods risk causing the tick to vomit into you or defecate onto you. Proper tick removal tools are a must, order yours. 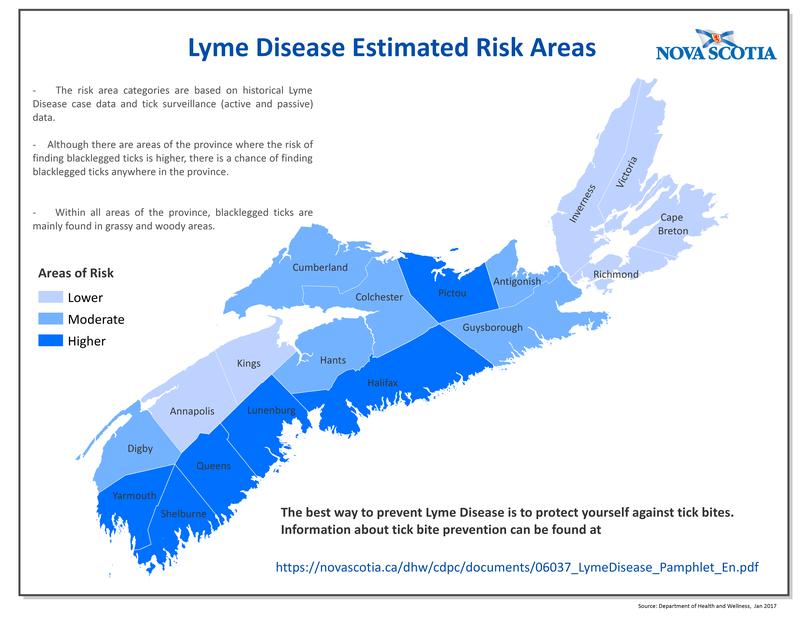 Posted in Co-infections, For Physicians, Government reports & letters, Lyme in Nova Scotia, Miscellaneous, Voices on Lyme and tagged Lyme disease risk, map, Nova Scotia by Canlyme. There is a wide spread rumour going around that peppermint oil is great for removing ticks. I just watched a video. One drop of peppermint oil and the tick removed itself from under skin. There are some experts who have indicated it may not be safe, as oils and other methods often cause the tick to regurgitate (vomit) into your blood stream carrying within the vomit many potential pathogens. One item not mentioned in all the talk about ticks is that “A tick has to see the sky”. With all the clear cutting in Nova Scotia these days, a breeding ground for ticks is expanded more and more. I have a woodlot of trees at least 50 feet high and an almost continuous overstory. I have never had a tick on me on that woodlot. If I have to travel on a neighbour’s property to get around a piece of water or for what ever means, than I get hundreds. This principle holds true in my work as a construction surveyor. Bring back the small tree act and there will be a lot fewer ticks. Interesting. We have a cottage in Hants Co., and it seems like they are everywhere. One thing that I have noticed is that the ticks seem to disappear during the dry season. When there hasn’t been rain for awhile, we don’t tend to see any. After the rain, they come out in droves. The tall grass thing is also a myth. We have gotten them on us while being out on the 4-wheelers, on wide, gravel logging roads (with no grass around).